Keeping fit is extremely popular right now with the weight loss industry alone being worth about two billion dollars every year. For the avid exerciser the option to track and monitor your heart rate and daily footsteps is a prime opportunity for self-improvement; as the old saying goes “you can’t manage what you don’t measure”. The Garmin Forerunner 235 is a stylish and innovative product that will easily and discretely support your weight loss and fitness goals. 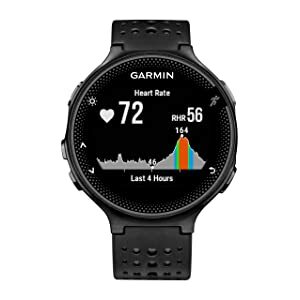 The Garmin Fore Runner 235 tracks your heart rate 24/7, measuring how long you sleep for each night and giving you an alert when you have been stationary for too long. This heart rate tracking allows you to measure your own heart rate as accurately as possible without an inconvenient chest strap so you can see how quickly you are recovering after interval training for example, you can even set it to warn you when your heart rate exceeds a certain value for your safety and peace of mind. Tracking your sleep patterns will enable you to figure out if you’re getting your eight hours and optimize your recovery. The Forerunner 235 is fully compatible with modern smartphones allowing you to check in on your emails, text messages and call alerts so your never out of touch. 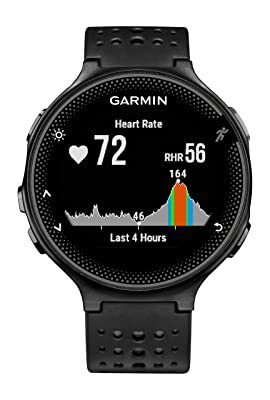 If you so desire, your device will sync with Garmin Connect which will enable to monitor your progress online and see tonnes of features such your elevation, running cadence, calories burned and so on. You can choose to give yourself the added motivation of making your results public, ensuring accountability which has been demonstrated to be a very helpful factor in adopting new habits in numerous studies. Or keep your data private, it’s up to you. The Screen of the Garmin 235 is 40% more visible than the older model while the watch itself weighs less than 2 ounces. This larger screen enables the vital data to be easily readable while exercising vigorously and the lightweight makes for high levels of comfort without detracting from performance. You’ll find it hard to believe they squeezed in an accelerometer, GPS, audio and a battery with over 2000 hours charge in such a small package. Overall, the Garmin Forerunner 235 is highly recommended and comes with many advanced features such as smartphone compatibility, automatic workout tracking, a large and readable screen, light and convenient size, many statistics such as V02 max, running cadence and so on. It comes highly recommended to the avid running fan who will get miles of value out of it.